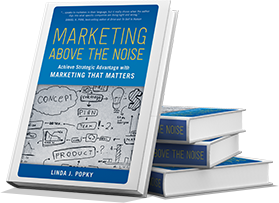 Award-winning marketing expert Linda J. Popky, the founder and president of Leverage2Market Associates, transforms organizations through powerful marketing performance. 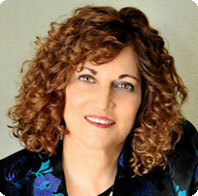 Her clients range from small businesses and consultants to mid-sized companies and large Fortune 500 enterprises. She lives and works in Silicon Valley, where she’s been involved with many of the companies who developed and deployed the technologies that have changed the world over the last twenty-five years, including Sun Microsystems, Cisco Systems, NetApp, PayPal, Plantronics, Autodesk, Applied Materials, and others. A consultant, speaker, and educator, Linda has been named one of the top women of influence in Silicon Valley and inducted into the Million Dollar Consultant® Hall of Fame. 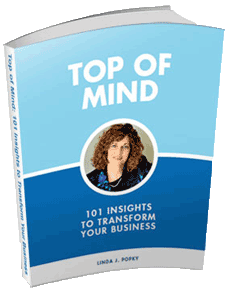 She is the past president of Women in Consulting and was the first marketing expert worldwide certified to offer the Private Roster™ Mentoring Program for consultants and entrepreneurs. Linda has taught marketing at San Francisco State University’s College of Extended Learning, University of California Santa Cruz Extension in Silicon Valley, and West Virginia University’s Integrated Marketing Communications program. She holds an MBA and a BS in Communications from Boston University. A classically trained pianist, Linda recently released Night Songs, a CD of classical piano music.